Remove root and green tops from leeks. Slice in half lengthwise and rinse well under running water. Slice crosswise into ¼ inch slices. Scrub potatoes well; cut into small cubes. Melt butter or margarine in a 2-quart saucepan over medium heat. Add garlic and chopped leeks. Cook until softened. Add potatoes and enough broth to cover. Cover pan and simmer until potatoes are soft. Mash with a potato masher or fork until potatoes are fairly smooth. 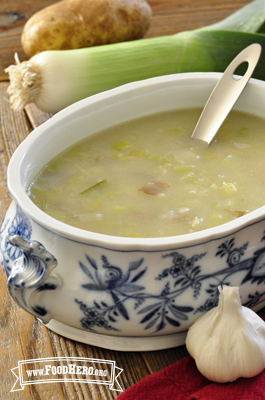 1 Comments for "Creamy Potato Leek Soup"
I love this recipe! It's so cheap and easy to prepare.